New Arena senior writers Dylan Fraychineaud, Harris Ahmadzai, and Jason Fray will offer their divisional and World Series predictions for the upcoming 2019 season. It may seem a little crazy to go against a team that won 108 games in the regular season and steamrolled their way through the World Series, but I like the Yankees to narrowly win the East over the Red Sox. Playing without Didi Gregorius will surely make a difference, but DJ LeMahieu and Troy Tulowitzki should be able to combine to fill the hole left by Gregorius’ absence. Both the Red Sox and Yankees will be near the century mark at the end of September, but I’m giving the edge to New York. I’ve picked against the Red Sox too many times for my own good. The defending World Champs bring back an All-Star squad that is oozing with talent from every spot. Andrew Benintendi and Rafael Devers are primed for breakout years. Mookie Betts and JD Martinez and MVP candidates. Chris Sale is one of the three best pitchers in baseball, and Nathan Eovaldi emerged as an ace during last year’s playoff run. Alex Cora has proven his mettle, and will have his team in a position to clinch the AL East crown during the last week of the season. After last year’s iconic run from start to finish, we’d be foolish not to offer the reigning champs a bit of respect. Boston certainly does need to sort its bullpen situation out (with Craig Kimbrel still bizarrely remaining a free agent). However, there’s not a more dangerous lineup in the game today. Expect the Red Sox to continue to tinker when it involves adding pitching for the stretch run. While the AL East has three teams more than capable of making the playoffs, the Central is largely a one-team race. The Indians are far and away the most talented team, and should win the division with little to no trouble. If there is one team that can potentially challenge them, however, it is the Minnesota Twins. The Twins struggled last year after making the postseason in ’17, but they have the ability to be a nuisance. Still, Cleveland’s pitching staff alone is enough to win the Central. Not to mention Francisco Lindor and Jose Ramirez. The Indians have serious issues in their lineup. Francisco Lindor hasn’t been able to stay healthy this Spring, Michael Brantley is in Houston, Josh Donaldson is in Atlanta, and Jose Ramirez can’t do it all on his own. The starting pitching remains elite, but the lack of depth in the bullpen and pop in the lineup worries me. Minnesota added legit power with Nelson Cruz and Jonathan Schoop, and utility man Marwin Gonzales should be serviceable while Miguel Sano heals. While they don’t have the starting depth to hang with Cleveland, Minnesota’s No. 1 Jose Berrios has awesome stuff and is a dark horse Cy Young candidate. The Twins will also benefit from a soft schedule to end the year, and could be in pole position if the Indians fall behind early. The AL Central may be the weakest division in all of baseball. Outside of potentially Minnesota, there’s not another team close to Cleveland in terms of talent or starting pitching depth. It will be fascinating to see how Cleveland approaches the trade deadline. It may need an influx of something special in order to get the team back to the World Series. It may be fair to question the depth of Houston’s rotation, but Justin Verlander and Gerrit Cole are a pretty good 1-2 punch. 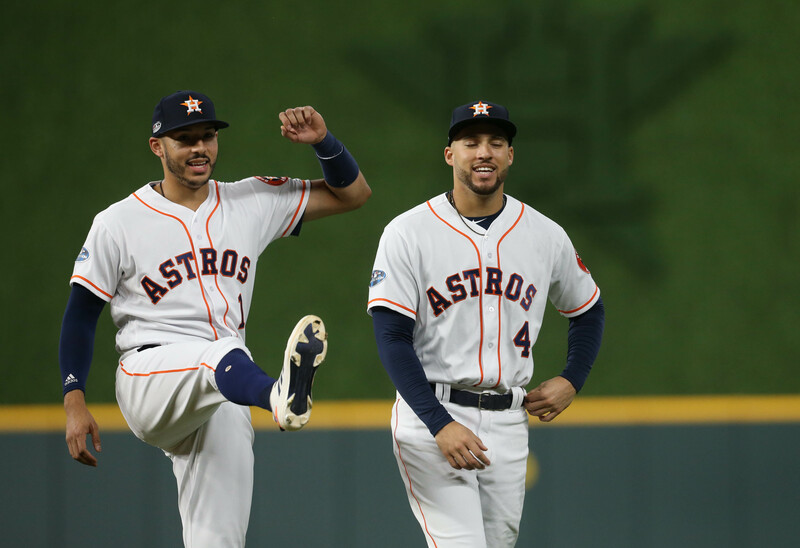 Despite injuries robbing time from Altuve and Correa a season ago, the Astros won 103 games. Barring injury, it is hard to imagine this team failing to win the West. Oakland should be good again, but I believe it is unrealistic to expect another 97-win campaign. The Angels also can put some pressure on Houston, but I don’t think they have enough to put a real scare into them. The Astros will win the division, and it may not be that close of a race. The Stros were surprisingly challenged by the A’s towards the tail-end of last year. Houston ended up winning six more games, but Oakland shockingly produced more runs than a team that looked like it could be the greatest offense of all-time. Houston will (likely) lose two key pitchers through free agency — Dallas Keuchel and Charlie Morton — and another to injury — Lance McCullers Jr. — but still have two dominant aces at the top. Carlos Correa should be healthier and better, Brantley adds a new dimension, and Alex Bregman has established himself as an elite hitter. The rest of the division will be better this year, but the Astros have all the makings of a World Series contender. This is Houston’s division to lose. The Angels should be improved, and the Athletics will hang around and be better than expected. With that said, both Seattle and Texas are abysmal. Houston will fatten up on those two — whilst letting LA and Oakland cannibalize one another. Aside from that, this stacked roster is motivated to get back to the Fall Classic after being dismantled by Boston last year. Collin McHugh, Brad Peacock, and Wade Miley join a completely revamped pitching staff. Duly, Michael Brantley is expected to add some nice pop to the lineup. The Red Sox won’t win 108 games this season, but they still have far too much talent to be shut out of the playoffs. Boston will be neck-and-neck with the Yankees down to the wire, but ultimately fall short by a game or two for the East crown. The second Wild Card spot is tougher to pick. The A’s, Angels, Rays, and possibly the Twins, should be in contention. In the end, I’ll take the team with Blake Snell. Tampa won 90 games last season but were overlooked due to the Yankees, Red Sox, and Astros winning 100+ games, as well as Oakland notching 97. In an upset, Tampa will knock off the reigning champs in the one-game playoff. Severino vs. Kluber in a one-game playoff in Yankee Stadium? Sign me up. Only once in seven years have two teams from the same division faced off in the American League Wild Card game. I’m going to stick with this trend, and expect to see a repeat of last year’s Wild Card game. The Yankees are quite powerful, and the Athletics are MLB’s version of the little brother who has a tendency to win a game of H-O-R-S-E more frequently than the big brother would like. Year one sans Dusty Baker couldn’t have gone much worse for the Nationals. After winning 95 and 97 games the previous two years, the Nats finished 2018 with only 82 wins. The Braves, who arrived ahead of schedule last year, should be even better in ’19. The Phillies have added multiple stars to their roster — including former National Bryce Harper — and are a trendy pick to win the National League. The Mets have two of baseball’s best pitchers and can’t be counted out completely. Still, the Nationals have loads of talent. Between their pitching staff and depth throughout their lineup, the Nats may be the best team in the division — despite the hype Philadelphia and Atlanta will receive. This race is going to be good. The Nats lost Bryce Harper, but gained a great arm in Patrick Corbin and will have a full year of 20-year-old sensation Juan Soto. Atlanta was a year ahead of schedule last year. Adding Josh Donaldson to a team filled with gifted youngsters has a chance for explosive results. But the Phillies still boast the most talent of the lot. Harper, Andrew McCutchen, Jean Segura, Rhys Hoskins, and JT Realmuto is a scintillating core, and the starting pitching will go from good-to-great if the Phils can get contributions from Nick Pivetta and/or Zach Eflin. After infamously squandering the division lead last year, the re-tooled Phillies will be back for the NL East crown. Everyone will want to pick the new-and-improved Phillies, or the upstart Atlanta Braves. There’s even the New York Mets and their stellar pitching staff to contend with. However, I’m going out on a limb to suggest that the Nationals will win a highly competitive NL East. Washington no longer has the Bryce Harper saga hanging over its head. While his loss isn’t easy to replace, the Nationals will insert two of baseball’s most promising young players — Juan Soto, Victor Robles — into the starting lineup. When further factoring in the game’s best pitcher (Max Scherzer), some pop (Anthony Rendon), some speed (Trea Turner) and a proven veteran (Ryan Zimmerman), this team could very well surprise some people. In what may end up being the best division top-to-bottom in baseball, I like St. Louis to win the Central. The addition of Paul Goldscmidt should pay immediate dividends for the Cardinals. I don’t expect Milwaukee to win 96 games again, and the Cubs may have too many distractions this year. In the end, St. Louis’ mix of established stars and promising young players will put them over the top. The Cardinals are young and stacked. Their outfield is one of the best in baseball — and that still holds even after trading Tommy Pham last season. Their pitching staff is filled with 20-something flamethrowers. Bringing in Paul Goldschmidt could end up being the biggest move of the offseason, and if Matt Carpenter is just 90 percent of what he was to end last year St. Louis may have the best one-two punch in all of baseball. Chicago and Milwaukee will hang around, but I see the Cards getting over the 100-win mark. St. Louis is primed to be a real threat to win the National League in 2019. The lineup has a nice mix of power and depth. Landing Paul Goldschmidt gives the Cardinals a legitimate All-Star in the heart of their order. Duly, the pitching staff is chock-full of young, exciting arms. All of the ingredients are there for this time to challenge the Dodgers for National League supremacy. Much like the Indians in the AL Central, the Dodgers have the clearest path back to the postseason in the National League. The Giants are entering another rebuilding year. The Padres should be an improved club, but may be another year away from contending. Arizona could cause some trouble, but they also lost Goldschmidt, Patrick Corbin, and A.J. Pollock. Colorado should be the second-best team in the division, but there is no guarantee they can match their success from a year ago. The Dodgers should have no trouble securing their seventh-straight NL West title. Ho-hum, another NL West title appears to be in the cards for the Boys in Blue. Although they weren’t able to make the big splash in free agency, adding A.J. Pollock and Joe Kelly further bolsters the deepest roster in baseball. I don’t believe they’ll end up missing Yasiel Puig as much as some fans do. Moving Cody Bellinger to right field could prove to be a boon as a result. The Rockies and Padres will be improved, but I don’t see any other team getting to 90 wins in the division. With Arizona selling virtually every good player it had, the division is a bit weak. The Giants are in a rebuild, the Padres are a few years away, and the Rockies are snake-bit perpetually by Coors Field. The Dodgers are clearly the best team in the division — if not the entire National League. Joe Kelly will help the bullpen, A.J. Pollock should be an upgrade over Yasiel Puig, and Walker Buehler should take another step in becoming one of the game’s most promising arms. I believe only three or four games will separate the Cubs, Phillies, Brewers, and Braves. The Cubs will earn the first WC spot due to their lineup and experience. For the second team, I believe the Phillies will defeat Milwaukee in an extra play-in game. When it comes down to the two teams, Aaron Nola is simply better than any starter the Brewers can trot out to the mound. It may be foolish to go against the team featuring the reigning MVP, but Philly will come up big when it counts. My not-so-bold prediction for 2019 is that the two best records from the National League will once again come from the NL Central. Milwaukee is primed for another big year with the league’s best bullpen and reigning NL MVP Christian Yelich. I could see them replicating their 96-win season from a year ago. The second spot is a bit trickier to decipher. Among the quartet of serious candidates — Cubs, Braves, Nationals, Rockies — Chicago arguably has the worst starting pitching staff and there’s no guarantee their hitting is the best of the four. However, bounce back years from Yu Darvish and Anthony Rizzo could change all of that. At the end of the year it comes down to who I trust the most, and I’ve seen this Cubs group win countless big games. I won’t bet against them snagging the final spot. Both of these teams do have their respective warts. Yet, the strengths of their respective lineups will slug them into postseason play. 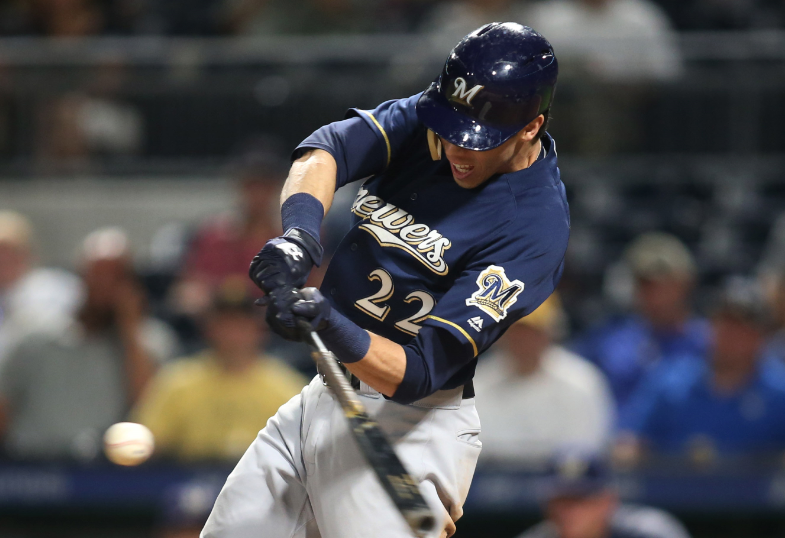 Milwaukee — featuring reigning MVP Christian Yelich — is loaded from top to bottom. The addition of Yasmani Grandal will add even more pop. Philadelphia saw a ton of turnover across the board. Not only did it nab the league’s best catcher (J.T. Realmuto), but it also landed the offseason’s biggest free agent prize in Bryce Harper. If there’s one thing going to keep either (or both) out of the playoffs, it’ll be a lack of quality starting pitching. The top of the American League is lethal. Between the Yankees, Red Sox, Astros, A’s, and Indians, it wouldn’t be a surprise to see any of those teams emerge from the pack. In the end, I believe Houston is the best all-around team. Houston — who will finish with the best record — will face Tampa Bay in the opening round. After dispatching the Rays, they will take on a Cleveland team riding high after toppling the Yankees. Despite Cleveland’s incredible staff and two stars in its lineup, the Astros will once again handle the Indians in the postseason. The top three from the American League is as stacked as I can remember. Either the Astros, Yankees, or Sox would be worthy Pennant winners. The talent in Houston and New York might be a tad bit better, but I’ve learned to never bet against a Boston team that’s being overlooked. This team just won 108 games, blitzed through the postseason, returned all of their best players (except maybe Craig Kimbrel), and Vegas still has the Yankees as the World Series favorite. The lineup depth, pitching staff versatility, and excellent manager will have the Red Sox playing well into October for the second straight year. After building a team through player development, smart trades, and cost-effective free agency decisions, the Yankees will yet again make the World Series. Luis Severino and James Paxton is a very good one-two punch at the top of the rotation. Gary Sanchez can’t be as bad as he was last year. 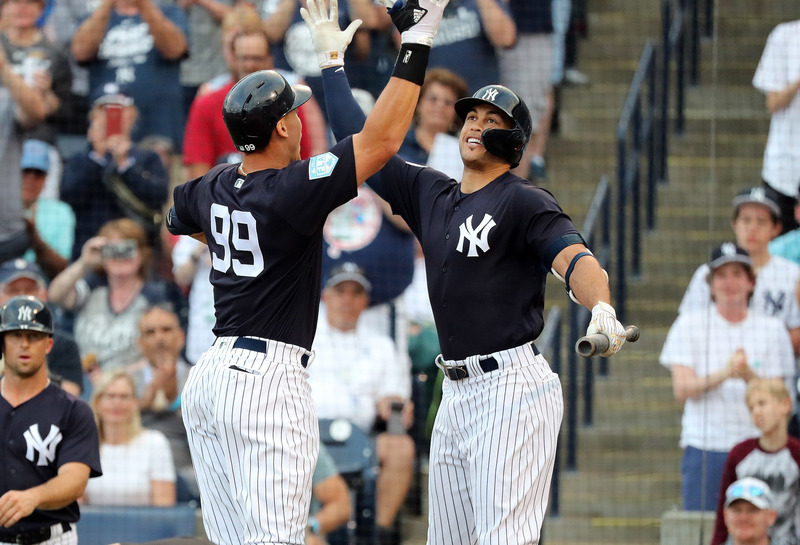 Duly, you’ve got the most feared duo (Aaron Judge, Giancarlo Stanton) in the game — not to mention an elite bullpen and two budding stars in Gleyber Torres and Miguel Andujar. Boston had its time last year, and will now look out at its most hated rival as the team to represent the American League. Last season, despite an awful start, the Dodgers finished a mere four games behind Milwaukee for the NL’s best record. While 92 wins is nothing to scoff at, the Dodgers realistically performed about eight games worse than their numbers would suggest. They finished the year with a +194 run differential — by far the best in the NL — and finished in the top-5 of most major stats. This year, they will win those extra games and lockdown the top seed. They will upend an untested Philadelphia team in the NLDS, setting up a showdown with the Cardinals for the NL Pennant. In a seven-game classic, the Dodgers will overcome an early deficit in Game 7 to clinch their third-straight trip to the World Series. The Dodgers have to be mentally drained from all of the previous postseason runs. Getting to the World Series three times in a row is something that hasn’t been done since the Yankees in 1998-2000, and team building was a whole lot different back then. The Phillies will be entertaining, but I worry about their depth and bullpen. St. Louis has a nice roster balance, and the perfect type of versatile pitching staff which can excel in a playoff series. The Cards get it going in the second half of the year, and ride their hot streak straight into the postseason. It’s going to be awfully tough for the Dodgers to get back to the World Series for a third-straight year. While depth and talent isn’t a question, luck is. A multitude of things have to go right for a team to make the World Series — let alone three times in three years. This hasn’t happened for a National League team since 1923. While it’s certainly not out of the question, I’m giving the nod to St. Louis in this scenario. I’m banking on the likes of Carlos Martinez, Michael Wacha, Miles Mikolas, and Jack Flaherty to all be integral parts of a deep run. Plus, the Cards can also rely on wily veteran Adam Wainwright for the occasional big-game effort (as well as a wicked 12-to-6). Two titles in three years for Houston, a third-straight year of heartbreak for the Dodgers. For me, this series comes down to two things: home-field advantage and Verlander. The Dodgers haven’t fared well against Houston’s ace in the past, and there is little to suggest that would change this time around. Game 7 will be a battle between Verlander and Walker Buehler, with the Astros ultimately pulling out a hotly contested 3-2 affair. A rematch from 2013, a St.Louis-Boston matchup would be absolute fireworks. Between Goldscmidt, Betts, Martinez, Carpenter, Boegarts, Benintendi, Ozuna, the list goes on and on for the offensive talent that would be on showcase in this series. It would be a toss-up, but I tend to side with the Cards in this one. They aren’t at a distinct disadvantage in any area, and Goldschmidt has the ability to completely take over a series. 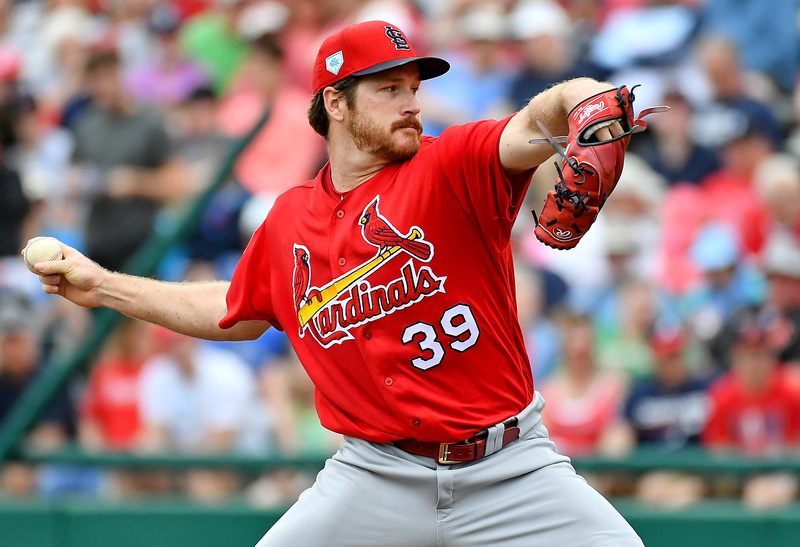 If Jordan Hicks, Andrew Miller, and the rest of St. Louis’ bullpen is humming come playoff time, they could run through the rest of the league. When comparing the two teams, St. Louis has the deeper pitching staff, a more contact-friendly lineup, and the unflappability of Yadier Molina leading the team. As we’ve seen in recent postseasons, teams possessing powerful bullpens are tough to play against. While the Yankees have no shortage of power arms, the same can be said for the Cardinals. Both Alex Reyes and Jordan Hicks can run it up in a hurry. The Cardinals have enough in the way of contact hitting to keep the ball in play, and thus not run into strikeout-heavy innings (something Judge and Stanton can struggle with).